U.S. Air Force Staff Sgt. 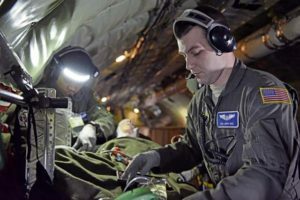 Yannick Sharras, left, and Senior Airman Larry Nice, 86th Aeromedical Evacuation Squadron medical technicians, prepare a patient for medical evacuation during training aboard a KC-135 Stratotanker over the skies of Germany, Jan. 23. During the training, members underwent emergency medical scenarios, including patients suffering worsening health conditions, cardiac emergencies, aircraft decompression and emergency ditching of aircraft. Members of the 86th Aeromedical Evacuation Squadron from Ramstein Air Base performed training aboard a KC-135 Stratotanker from RAF Mildenhall, England, Jan. 23. 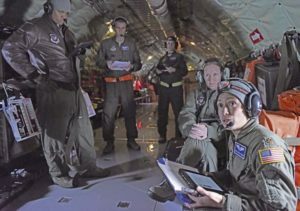 U.S. Air Force Maj. Mario Rocio Vazquez, 86th Aeromedical Evacuation Squadron medical crew director, provides a pre-flight brief prior to training aboard a KC-135 Stratotanker over the skies of Germany, Jan. 23. The aeromedical evacuation team consisted of two flight nurses, three aeromedical technicians and a collection of instructors and evaluators, who graded the annual evaluation of the squadron. “We perform this training to ensure our squadron is at full readiness and proficiency,” said Maj. Maria Rocio Vazquez, 86th AES medical crew director. U.S. Air Force Maj. Jeremy Hicks, left, 86th Aeromedical Evacuation Squadron flight nurse, shows members of the 86th AES how to administer intravenous bags during training aboard a KC-135 Stratotanker over the skies of Germany, Jan. 23. The 86th AES are charged with providing aeromedical care for both U.S. European Command and U.S. Africa Command, which is the largest area of responsibility out of all existing aeromedical evacuation squadrons.